Lovely water dispenser.. purchasing 2nd one soon! Working great, the plug need buy a adapter, and the wire is too short. Received the above item in good working condition. Thank you seller. Weird smell in the water even after using a few times of boiled water. Took a long time dispense water. Item received. Plastic taste in water, tried dispensing many rounds of water but taste still strong. Hello..I paid for the UK plug..but you delivered without..so I had to go buy an adapter. It does take some time getting use to it if one already owns one where the water volume is controlled by start/ stop button...but those may not have temperature selection and volume setting...but this one will be helpful for preparing warm milk, warm tea etc using the many temperature setting. BUT the box was overly plastered with masking tape..so I can't present it as a gift but will have to buy a gift box...overall I do like it... But the damaged box and the missing UK plug..lost out to a better scoring. P.S. I could have been luck with my order ...but..I would order again...as a gift forHouse warming and mothers to be..and for the office too. I've used it for a day or so..it was good until it broke down No water can be dispense or anything..just a beep and that's it Anyway I can fix this issue? Good product but only got 2 standard litre to choose. Nice and hassle free compared to boiler/kettle. just that hot water need to wait for few seconds to dispense. It come with few temperature. Hi seller if I only want 50ml or 100ml of water can I cut off the water halfway if I choose the 150ml button? how is the energy electricity consumption? Is it energy saving? Can I use tap water to pour inside to boil? What about the power plug? Local power plug 3 pin type or need an adapter before can use? Alright; thank you very much for your prompt reply. Dear buyer,you're welcome,have a nice day! Hi - I got one more question. As I cannot read or understand chinese - I'm just looking at the picture and thinking hard - is this wordings mean that the water is NOT boil at all? Since you mentioned that I can pour tap water into it to have hot water if I pressed the rest of the buttons like 45 deg, 55 deg, 65 deg, 85 deg and the last one - I think is 100 deg because of the boiling. But the 1st button which stated homoeothermy - meaning the temperature of the water is the same as the water that I pour in from the tap? That means it's not boil at all?! AM I correct? I attached a screenshot in chinese - is that to say the water is unboil if I pressed this button?! Dear buyer, choose which temperature of water, what temperature of water will come out, but tap water suggests that you choose boiling temperature, pure water can choose all temperatures. So what is the meaning of the 1st button? Unboil water? or No temperature? Dear buyer,after the first button is pressed, the unheated water will come out. OK, if I understand you correctly - so, the 1st button is the tap water. Therefore, I should NOT press the 1st button, am I correct to say that? Ok, I think I got what you meant. You are saying unless I pour in mineral water or pure drinking water or water that's already boiled and cool down - so, if I pour this water in then I can use all the buttons. 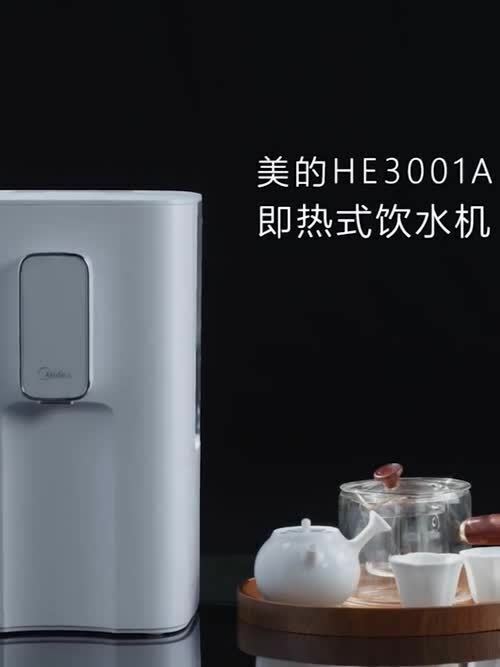 I have a kettle but I am trying to get rid of my kettle, so it seems I still have to keep my water to boil water, let it cool down before I pour into the Midea Water Dispenser. Yes, I understand but if I just want cool drinking water; then I think I must use kettle to boil first, cook the water then pour it in. Thank you so much for trying so hard to explain to me... and thank you for your patience in our communications. Have a good weekend ahead. I’ll placed my order when I am home this evening. Dear buyer, thank you for your support and understanding, have a nice day. May I know this water dispenser will last how long?easy spoilt? Dear buyer, this is very durable and there is no official display for how long it can be used.